© 1949 by Fred Rose, Inc. 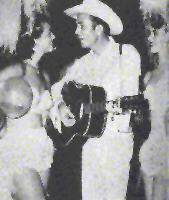 Original recording: Hank Williams with The Pleasant Valley Boys (Zeke Turner, Jerry Byrd, and Louis Innis), E. T. Herzog Studio, Cincinnati, OH, Aug 30, 1949 (master: 49-S-6072; released as M-G-M 10560, Nov 1949. Covered by Bob Dylan as an off-stage duet (fragment) with Joan Baez, Savoy Hotel, London, GB, May 2-6, 1965; featured in "Don't Look Back." I met Hank when he came to Nashville about three years before he died. We wrote a book together called "How To Write Folk And Western Music To Sell." One day I was over at Acuff-Rose, our mutual publisher, and Hank handed me a piece of paper and said, "Do you think people will understand what I'm trying to say when I say this?" The line was "Did you ever see a robin weep when leaves begin to die? It's because he's lost the will to live; I'm so lonesome I could cry." Hank had this lonesome streak, and I think it was largely caused by his marital problems. I think he wrote it out of a feeling of loneliness that stayed very much with him. He would be the natural person to write "I'm so lonesome I could cry." Dorothy Horstman telephone interview, Mar 2, 1974, reprinted in Sing Your Heart Out, Country Boy, New York, 1976, p. 179. Here is the chill of the void that would become one of the hallmarks of Hank's writing. It is the most oft cited example of Hank Williams the hillbilly poet, but its poetic form comes from the fact that it was originally intended to be spoken, not sung. Acuff-Rose staff writer Vic McAlpin said that Hank had written it for his first session of recitations slated for January 1950, but at some point he changed his mind. "I think ol' Hank needs to record this," he told McAlpin. Hank was concerned that some of the lines might sound self-consciously artsy and alienate his audience, but, as he so often did, he tried out the song on friends, fellow performers, and Fred Rose, and let them convince him that he had excelled. Zeke Turner underpinned "I'm So Lonesome I Could Cry" with recurring figures on the bass strings of his electric guitar. A few weeks earlier, he had led the backing on The Delmore Brothers' King recording of "Blues Stay Away From Me," using very similar licks, and they were clearly still echoing in his mind. Jerry Byrd played a solo of unusual simplicity, paraphrasing the melody to haunting effect, with subtle adjustments of tone and volume. Hank delivered his words with utter conviction that never once sunk to bathos. Colin Escott, Hank Williams: The Biography, Boston, 1995, pp. 114-115.
as reprinted in The Songs of Hank Williams, New York, no date, pp. 78-79.